‘Tis the season for Christmas cookies!! I don’t know about you, but I’m using every excuse I can think of this season to make holiday treats. This recipe for Peppermint Kiss Cookies is a variation on Hershey’s Candy Cane Blossoms … but with crushed candy canes and a bit of peppermint extract for extra flavor and a slight crunch! Yum! Combine powdered sugar, butter, extracts and egg in large bowl. Beat wet ingredients until light & fluffy at medium speed. Combine flour, crushed candy canes, baking powder and salt in a separate mixing bowl. Add dry mixture to wet mixture and beat until well blended (mixture will be kind of dry). Stir in chopped Candy Cane Kisses. 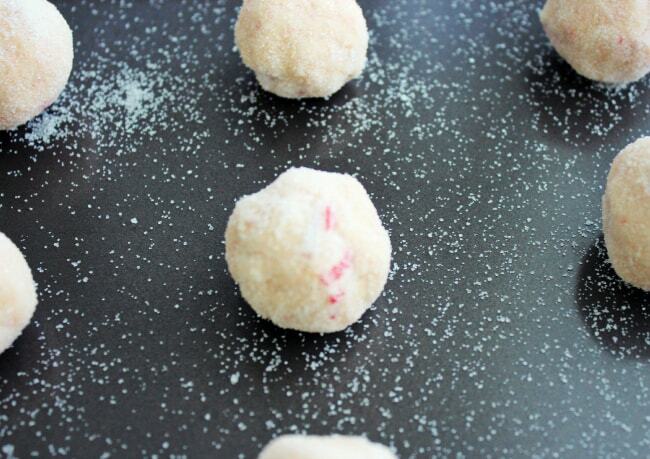 Shape dough into 1 inch balls; roll in granulated sugar. Place dough balls 1-inch apart on cookie sheet. Bake for 10-12 minutes in 350 degree oven until firm. Remove from oven and immediately press a Candy Cane Kiss in the center of each cookie. Place cookie sheet in refrigerator until ready to serve (keeps kisses from melting). These look SO good!!! I am gonna have to make these cause I am a huge peppermint fan!! Plus these would make a great gift for family and friends. What a cute idea! They look amazing. I’m not crazy about peppermint, but that looks delish! If I made these, I’m sure I would end up eating them all. I love all things peppermint and love this time of year for that very reason. Yum the peppermint kiss would be just the twist to make it refreshing. These look amazing! I love peppermint! 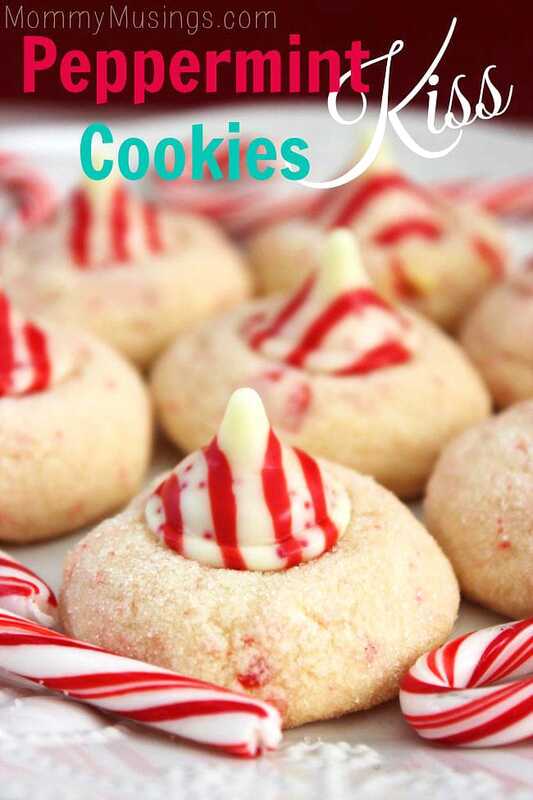 I am usually not big on peppermint desserts, but I have tried these Candy Cane Kisses and LOVED them! I’ve never had peppermint cookies before but I bet these taste really good! Those sound delicious. I love using different flavor Kisses to twist up the blossom cookies. My mom makes something very similar to this, but with regular kisses, I love the addition of peppermint! Those look to pretty to eat! YUM! These sound delicious and they are so cute! I make some a little different than this, but I think I’ll have to try your recipe next time. Ooh those look so yummy! I definitely need to make them. 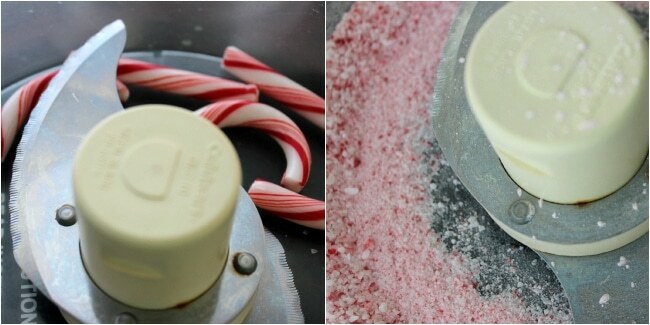 I absolutely LOVE peppermint, and I’m gonna make these to take to my mom’s. They sound sooooo good! I usually just stick the kiss on top of a sugar cookie, but will have to try your way next time. They look great! Thanks. These just look amazing! 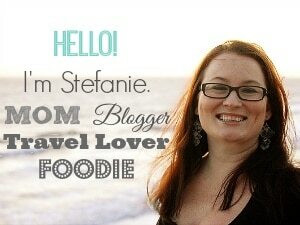 Thank you for sharing such an easy recipe! I think this has to be one of the prettiest sweet treats I’ve seen for Christmas this year! LOVE this recipe!